to do anything – but not everything is beneficial,” Paul tells us in 1 Corinthians. He goes on to tell us that our bodies are temples of the Holy Spirit who lives within us. 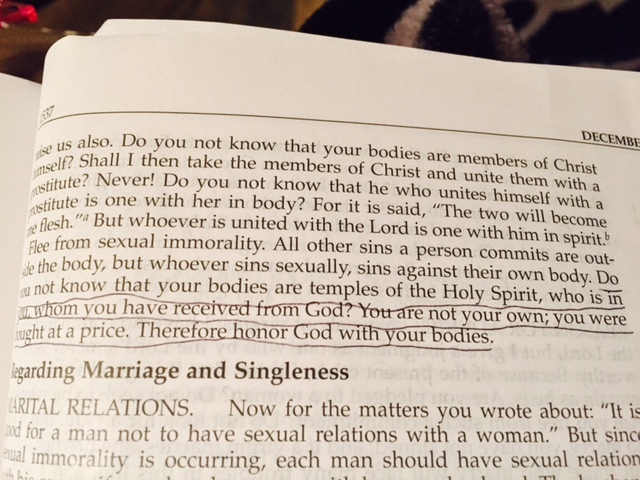 We were bought with a price and God wants us to honor him with our bodies. These verses also mention food. Recently, the Holy Spirit convicted me that this is true for me. Don’t you love how you can read these verses for years and then, suddenly, the Spirit uses one of them to rock your world? This is true for me and food. I needed to start using food for the right purpose – to nourish me. Not to comfort me or make me happy or to ‘treat’ myself. That’s not the way God wants me to take care of the temple of the Holy Spirit which is my body. When God made this a matter of obedience for me, it was a game-changer. We have the right to do a lot of things, but some of these things are not beneficial. So God tells us avoid things that are not beneficial – even if we have the right. This fits in with God’s direction to us that we will have to deny ourselves – what we want – when we pick our cross and follow him. It’s not easy, but it’s the truth. And lining up our lives with what God wants for us is always the right thing to do. Thank you, dear Father, for the truth.